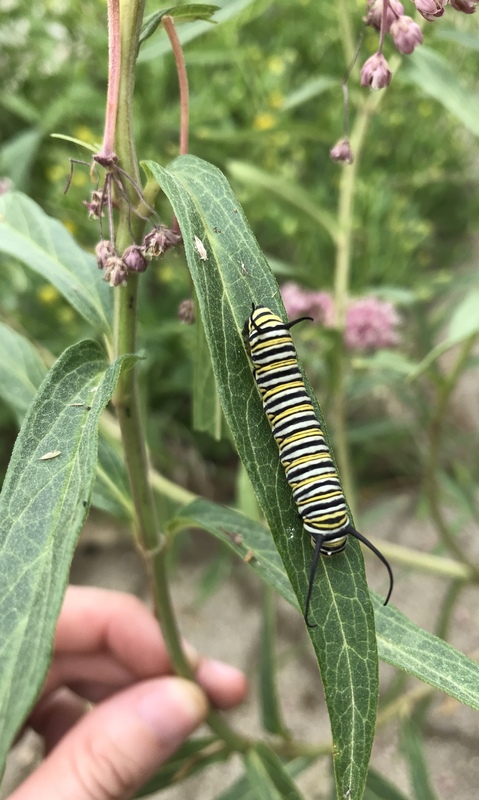 This time of year is great for caterpillar hunting. I have been finding lots of amazing, colorful critters munching away on the foliage here at Dyck Arboretum. I am always eager to get a picture of them, if I can, so that I can properly identify them later using guides and help from the internet. In doing so, I become engrossed in their beautiful and strange anatomies – spots, stripes, horns, hairs and amazingly grippy legs. There is much to know and discover! 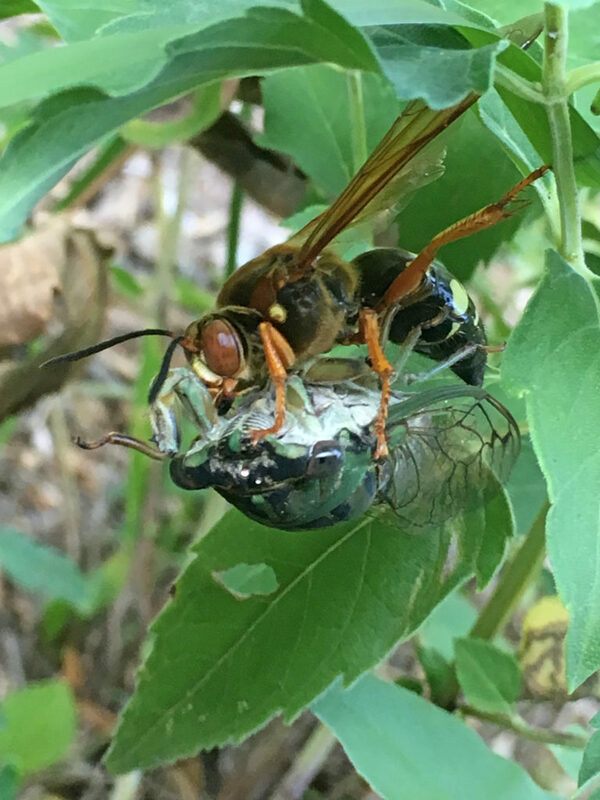 I get close up photos of insects on my phone using a clip on macro lens. By doing so I can see the tiny details on this white-lined sphinx moth caterpillar (Hyles lineata), like the yellow tips on his legs and the white spots on his head. 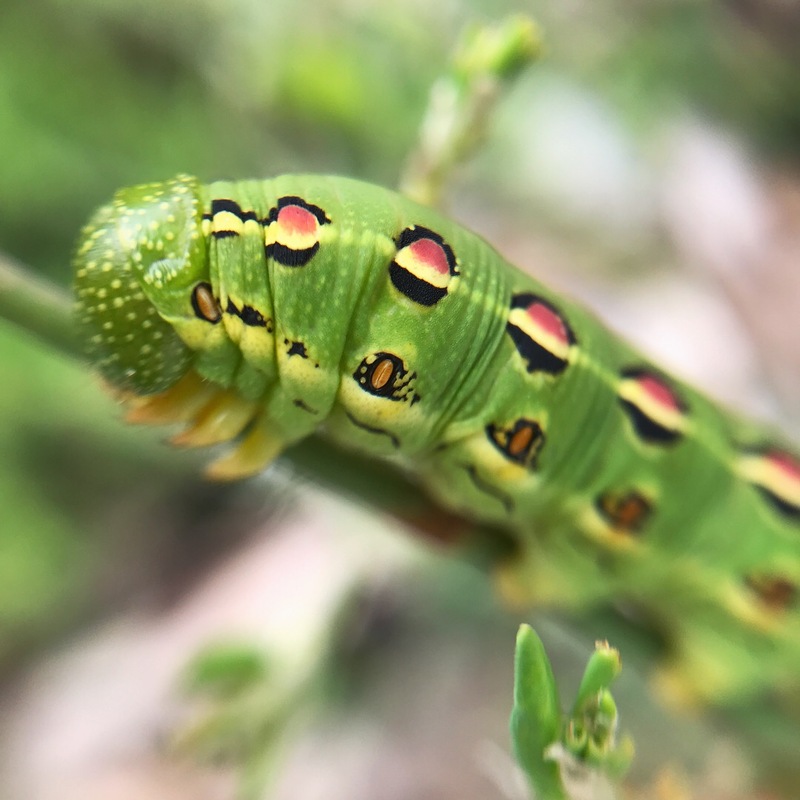 Also, caterpillars often sport wacky colors and patterns while most of the world’s worms are much more inconspicuous. Earthworms and some marine worms, roundworms, and tapeworms are usually sporting brown or tan skin. However, many types of ocean dwelling flatworms are incredibly colorful, though you won’t likely confuse these guys for caterpillars. 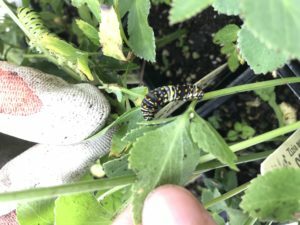 An adult black swallowtail caterpillar feeding on Zizia in our greenhouse. 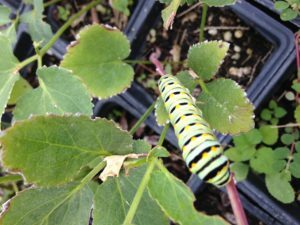 These swallowtails can only feed on plants in the Parsley/Carrot family. This black swallowtail caterpillar is in one of its early ‘instars’ or phases of development. 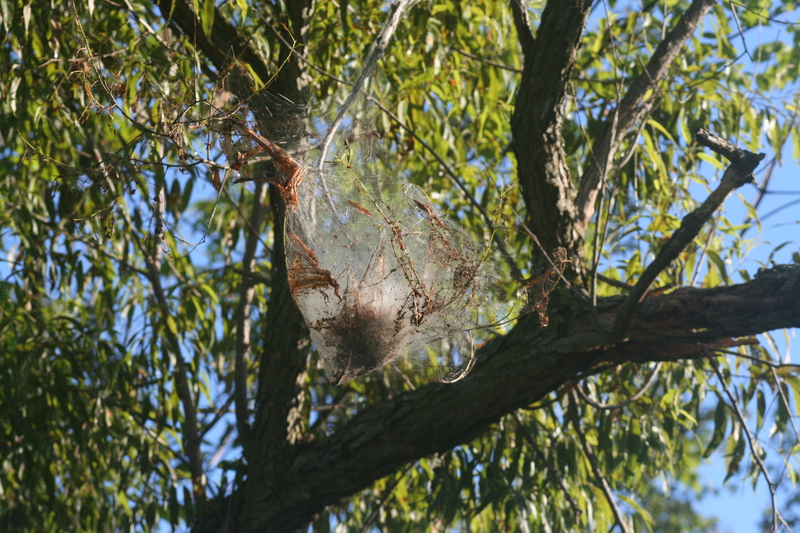 It will shed its skin as it gets bigger, and coloration changes during this process as well. 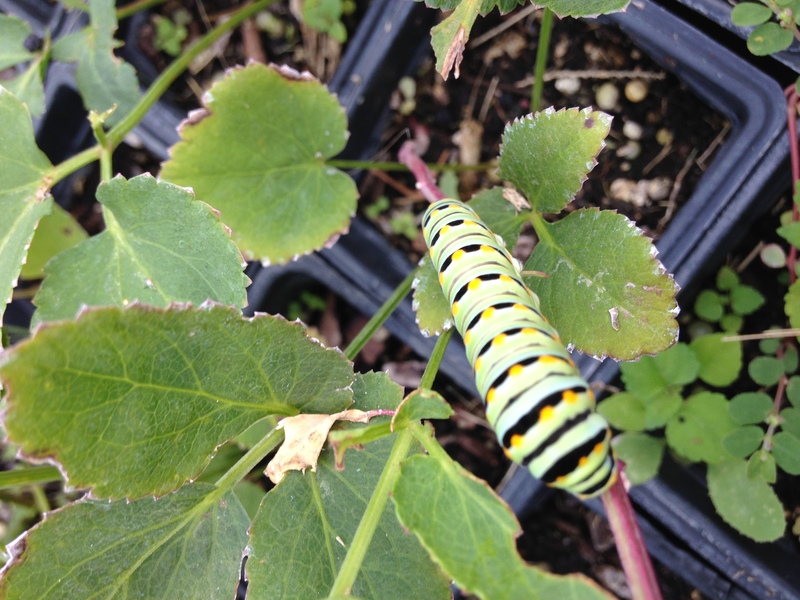 In the top left, you can see a black swallowtail caterpillar farther along in its development. Caterpillars are genius defense players. They are so packed full of protein and delicious to predators, they have had to evolve many ways to protect themselves. Some caterpillars, like the monarch butterfly, make themselves taste bad by eating milkweed leaves with toxins in them. Others try to look intimidating with aposematic coloration – body patterns and colors that warn predators to stay back! 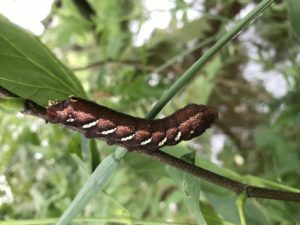 And some, like the spicebush swallowtail, even grow fake eye spots on their bodies to fool their hunters into thinking they are snakes. My personal favorites are the hairy ones. Caterpillars will sometimes grow hairs to make them hard or unpleasant to swallow. What bird wants a mouth full of hair anyways? Sometimes these hairs are designed to fall off and lodge in the skin/mucus membrane of whatever is disturbing it, causing an itchy rash in some people. 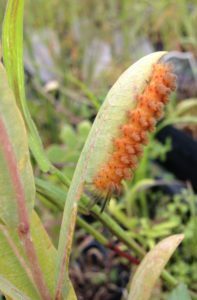 This is a cycnia moth caterpillar feeding on Asclepias sullivantii in our plant nursery. 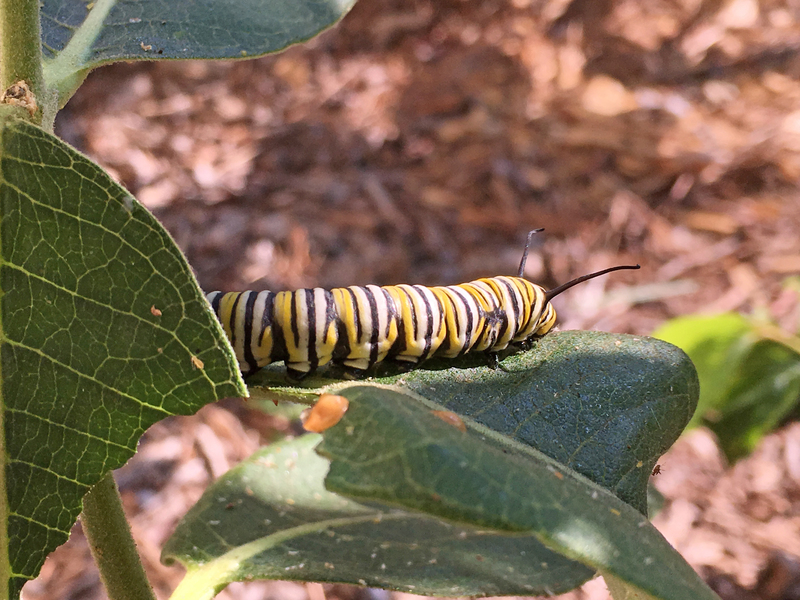 This little guy needs milkweed just as much as the monarchs, but doesn’t get the same press for some reason. I made sure not to touch him because of all those potentially itch-inducing hairs! In part II of this topic, I will talk a little bit about the specific parts of their body, special caterpillar diets, silk making abilities, and how you can design your very own caterpillar-attracting butterfly garden. Until then, keep a lookout for these special critters and do a little discovering of your own! Mulching is not an exact science, but as a general rule, we try to apply 2-3 inches of mulch consistently throughout the landscape. 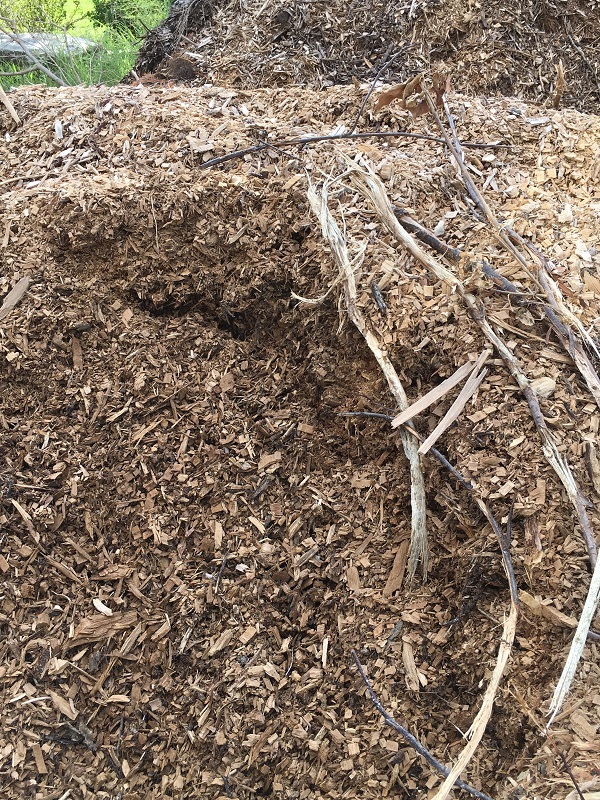 This depth of mulch will control weeds by decreasing sunlight exposure, which prohibits seeds in the soil from to germinating. More than three inches of mulch seals off the soil and suffocates your plants. It is extremely important that the plants are able to get the oxygen they need. Spread the mulch evenly and don’t build a mulch volcano around the base of the tree. Since mulch decomposes slowly, it is good to periodically check the depth and add some as needed. Mulch volcano at base of tree. A big no no! What is the best way to mulch? We start by laying out a garden hose, which allows you to visualize the curves and width of a bed. You can either spray the area inside the hose or dig up the vegetation and let it slowly die. When the area is cleaned up, we begin applying the mulch and leveling it to the desired depth. Keep in mind that too much mulch will encourage growth of the roots into the mulch, where it will be susceptible to freeze damage. The ideal 2 to 3 inch depth of mulch will keep the roots in the soil. We are mulching throughout the year, but direct most of our efforts in the spring or fall. As we clean up our display beds in the spring, it is always a good time to freshen up the mulch, too. At this time of year, soil temperatures are beginning to warm and a new layer of mulch will slow down the warming process. A new layer of mulch will also cover seeds that may have landed in the mulch and covering them now will prevent germination. We mulch anytime a new tree or shrub is planted. This practice will keep the soil cooler, help retain moisture longer and insulate new roots from the cold weather. Some thicker mulch areas may benefit from being fluffed from time to time. Simply take a rake and loosen up the top few inches of the mulch. We use whatever is available to us. Mulch is not cheap, so we use chippings from the tree trimming service. We have used semi loads of hardwood mulch, which is expensive. It is not as important what you use, but how much you use. Even free mulch can look attractive and function just like the most expensive mulch. For sloped areas, the larger and heavier mulch works the best. It is not as susceptible to runoff or wind displacement. Smaller or finer mulch decomposes quicker too. The bottom line is use what is available to you. Can I use plants as mulch? In the book Planting in a Post-Wild World: Designing Plant Communities for Resilient Landscapes, Thomas Rainer and Claudia West develop the ideas of layering plants. There are usually at least three distinct layers of plants: the upper layer filled with taller structural plants used to frame and punctuate the landscape, the middle layer filled with ornamental flowering plants and the ground level that weaves the other layers together and shades the soil, which controls weeds. These layers mimic natural plant communities and each layer is important for the health of the plants. 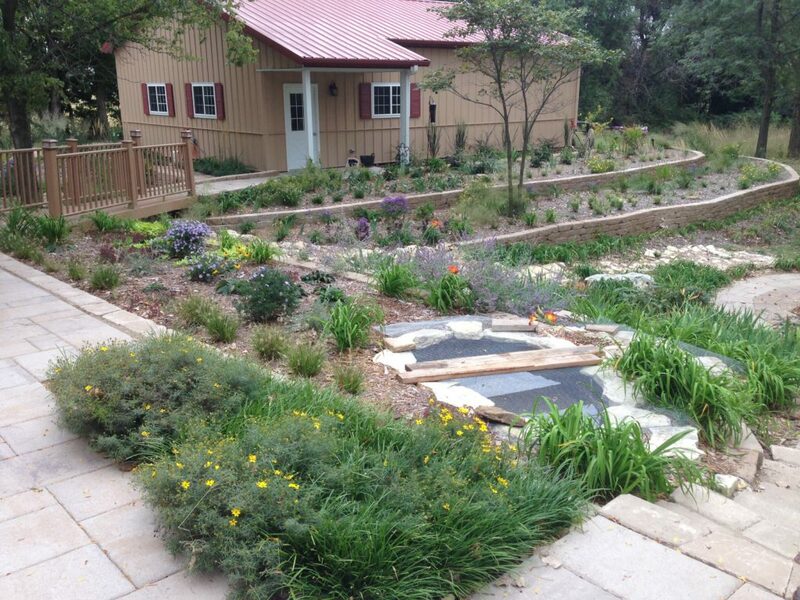 A collection of plants living in community can be extremely drought tolerant and water-thrifty. 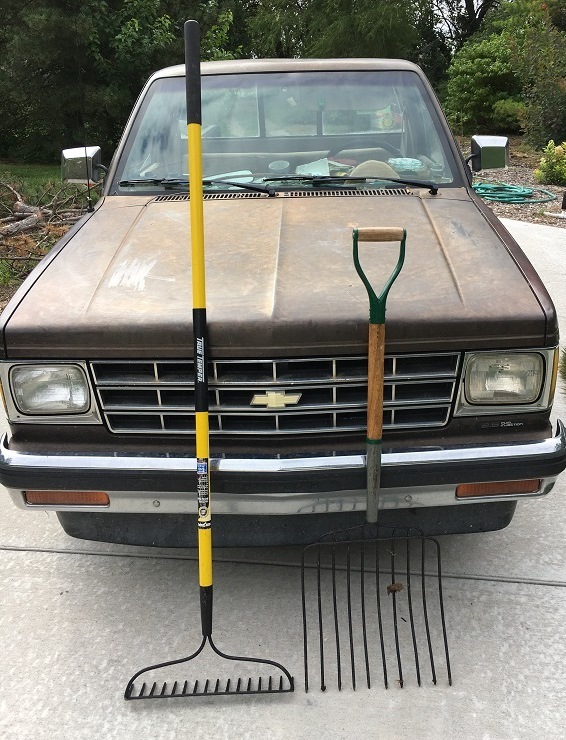 Purchase a heavy duty mulching fork and stiff garden rake for leveling. Insects can be a problem in mulch, so keep it away from the foundation of your house and base of the plants. Termites generally like larger pieces of wood but can even live in the finer mulch, especially if it is too thick. Landscape fabric under mulch is something we avoid. It only keeps weeds out for the first few years and then the decomposing mulch turns into compost, which is ideal seed bed for weeds. It is also hard to transplant into it and often suffocates the soil. We have purged the Arboretum of just about all landscape fabric. Save your money and buy more plants. You can use rock as a mulch, but don’t buy the recycled rubber mulch. The rubber mulch may last forever but it does nothing great for the soil or the plants around it. In fact, the compounds and residues that leach over time may do more harm than good. Last week the Arboretum staff visited a flower farm near Lawrence. It was interesting to see how they were growing their flowers to be used in arrangements and displays for special occasions. They focused on native plants, but also had some annuals, bulbs and shrubs, too. During our tour, the topic of irrigation and water use were explored, because they are under severe drought conditions. It made me think about our irrigation practices and ways to create a water-wise landscape. Here are five water saving practices for you to implement in your garden. 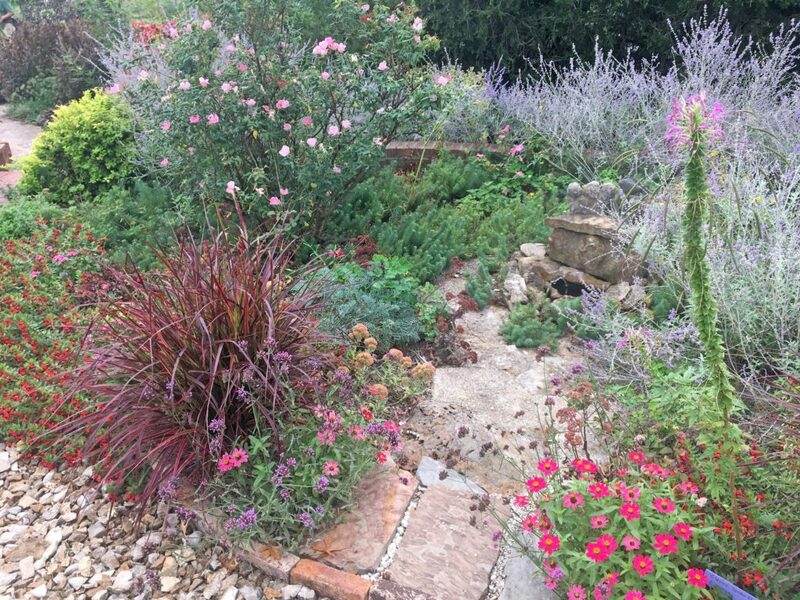 One of the biggest mistakes I have made when establishing a new garden is choosing plants that I like rather than plants that like the area in which I am trying to establish them. There is a big difference. It is critical to match plants to the site. The closer they are adapted to your landscape the less water they will need to survive. 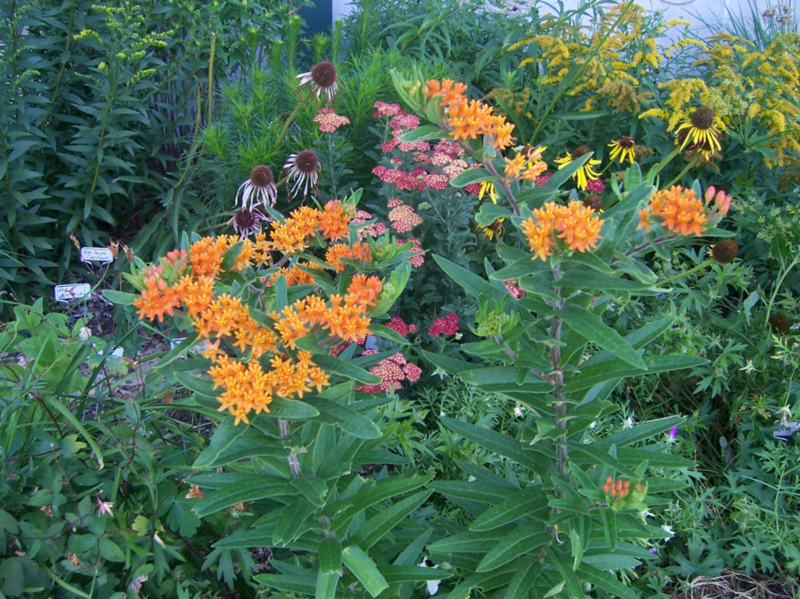 Native plants are always a good choice, because they are already adapted to our climate. Evaluate your landscape’s soil, sun exposure, and moisture content. By understanding these aspects of your landscape, you will be able to make informed plant choices. There is a palette of plants that will almost effortlessly grow in your garden. Grouping plants with similar water needs that match your landscape conditions will ensure success. In their book Planting in a Post-Wild World: Designing Plant Communities for Resilient Landscapes, Thomas Rainer and Claudia West develop the ideas of layering plants. There are usually at least three distinct layers of plants: the upper layer filled with taller structural plants used to frame and punctuate the landscape, the middle layer filled with ornamental flowering plants and the ground level that weaves the other layers together and shades the soil which controls weeds. These layers mimic natural plant communities and each layer is important for the health of the plants. A collection of plants living in community can be extremely drought tolerant and water-thrifty. Mulches can be a blessing and a curse depending your mulching practices. 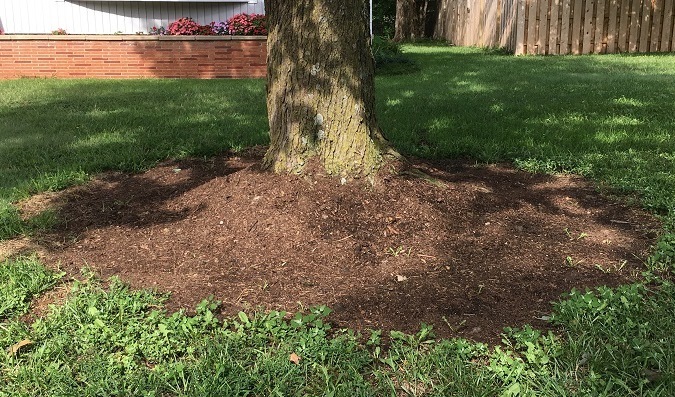 We typically apply a two to three inch layer of mulch around a tree by simply mulching a tree a few inches away from the root flare and extending out to its drip line. Shrubs get the same treatment. 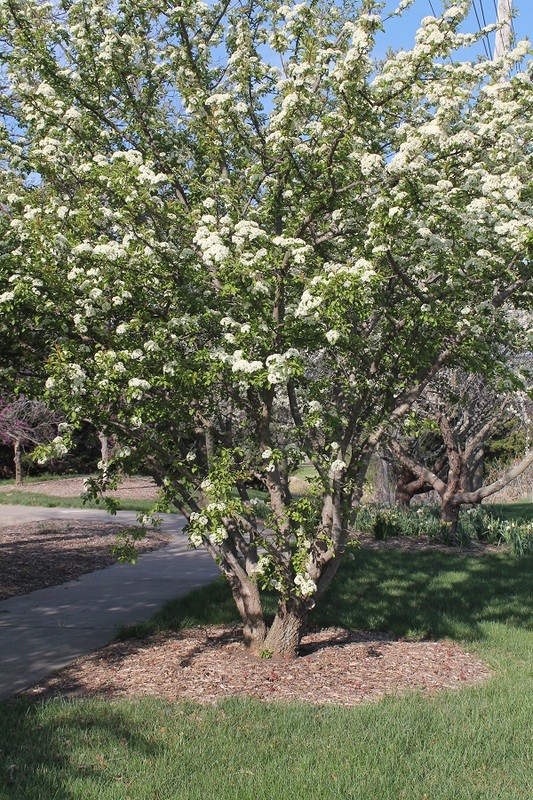 It is vital to keep mulch several inches away from the trunk or stem. Please, no mulch volcanoes! Mulches prevent weeds, eliminate erosion, retain soil moisture, help moderate soil temperatures, provide a buffer between equipment and the trunks and stems and increase the aesthetics of the overall landscape. Too much mulch (over four inches) starves roots of oxygen by sealing off the ground suffocating the plants. Old mulch can matte up and restrict water infiltration, too. During times of prolonged drought, irrigation may be necessary. Plants naturally go dormant, but in a display bed you can add supplemental water to keep them more vibrant and healthy. 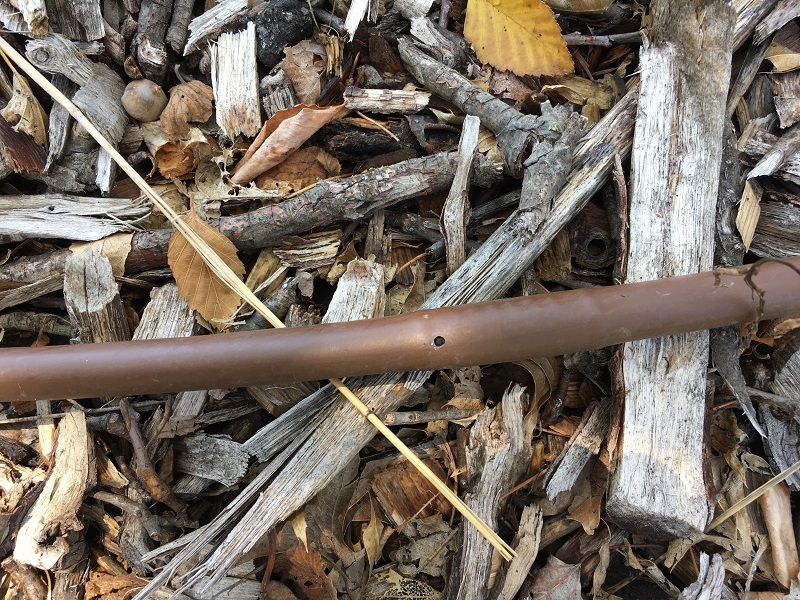 We use pressure compensating drip irrigation tubing with emitters spaced 12 inch apart. Drip irrigation puts water where it is needed for optimum efficiency in the root zone rather than on the leaves. If you irrigate with overhead sprinklers, start sprinklers early in the morning or later in the evening. Avoid watering during the hottest part of the day to reduce evaporation and loss from wind. You can also recycle rainfall and create a rain garden. Cool season grass lawns with roots that are maybe six to twelve inches deep are one of the most watered landscape plants. 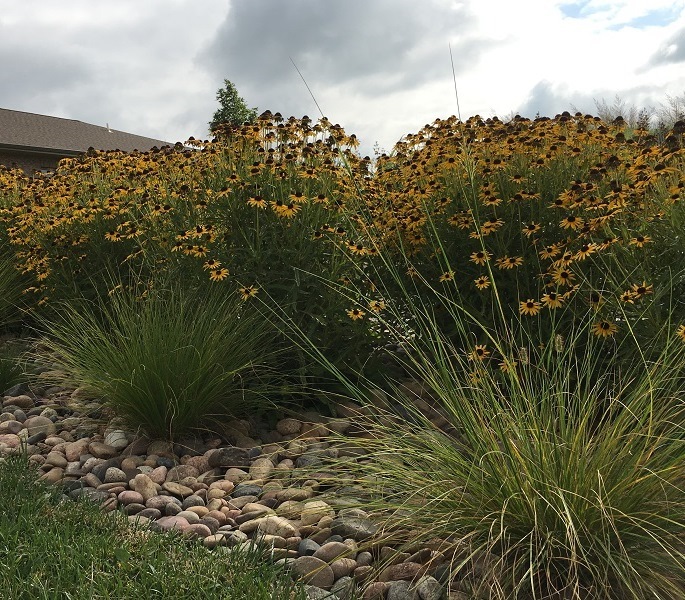 If you think strategically and replace part of a water-guzzling lawn with deep rooted wildflowers, grasses, shrubs and trees or even with native buffalograss, you will save water and increase wildlife diversity in your landscape. You may like open spaces with lawn for play or leisure, but you can scale back the size of your lawn and still have the aesthetics you appreciate. Mow your lawn at the highest height and water only as needed. Turfgrass has its place in the landscape, but maybe not the most prominent place it currently does. We don’t think often enough about the water we use. It is a precious commodity. Remember the 2011 and 2012 drought in Kansas? We were using tremendous quantities of water to keep our landscapes alive. It made us evaluate each plant according to its response to these extreme conditions. Obviously, some plants did better than others and we lost some plants those years. It made us think critically about our plant choices and irrigation practices. A beautiful and resilient landscape that uses little if any supplemental water is an achievable result. A few changes can make a big difference.